How to store and retrieve images from Access database using ASP.NET? 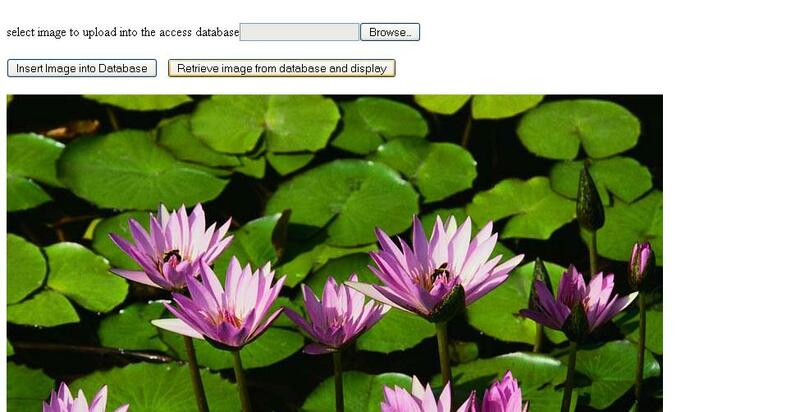 In this article I will explain about how to store and retrieve image from access database using ASP.NET. Images are stored in the database as bytes. In my previous articles I have explained in detail about How to store image in SQL SERVER database table? and How to retrieve images from SQL SERVER database table etc. I have recently saw one more question in forum its related same like my previous article topics but user want to store images in the MS Access database. I have use file upload control to get user selected images and convert that image in to bytes then stored in the MS ACCESS database using like below code. &LT;asp:Button ID="Button2" runat="server" Text="Retrieve image from database and display"
Here I have attached full source code for the same download it and test it. I hope this article is help you to know about how to store and retrieve image from MS ACCESS database.